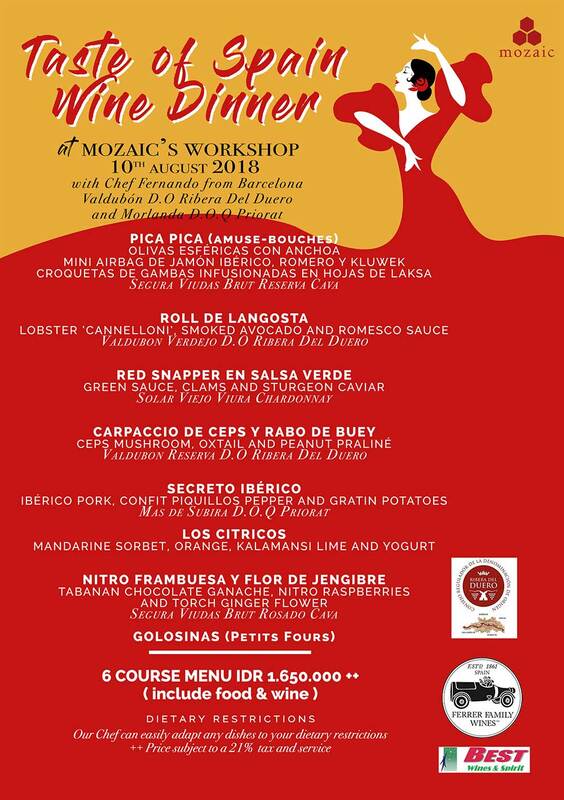 On the 10th of August, Mozaic restaurant, Best wines and Spanish premium winery Valdubon Estate from Ribera del Duero will present an exquisite Spanish Wine Dinner in Mozaic’s private dining room (The Workshop). Our Chef de Cuisine Fernando Corella, from Barcelona will create a unique 6-course degustation menu of Spanish cuisine with Mozaic flair. Price: Rp. 1.650.000 ++ for food and wine pairing. This exclusive event is limited to 40 people. Bookings are highly recommended.